Well, as it's a three day weekend all those who can be are far, far away from the keyboards and monitors. 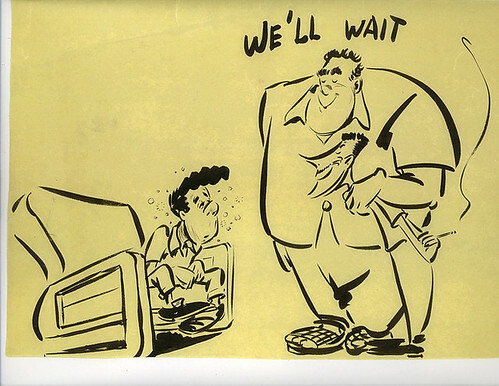 Fred Moore confronted by his pals Riley Thompson and John Sibley at Disney's; I'm not sure which one drew this, but I don't think it was Fred. By the way, it's telling that for all the latter-day headshaking--understandably--re: Moore's drinking--this is obviously the way it was viewed at the time by his friends; a very different era. The title is suggesting that Sibley and Thompson will wait for Fred to get over his hangover-before they commence to have one together! To leaven the return to the desks next week, I'll be posting some of the Fred Moore collection of James Walker. Among the goodies: studies for "All The Cats Join In", "Fantasia", what look like some helpful demonstrations of animation principles likely done for another artist, early 50's things he tossed in his trash that were rescued by a fellow artist, a fantastic, super-rough study for one of his more elaborate presentation girl setups, rough poses of Jose Carioca and the Little Gauchito, animation roughs of Pluto from "Pluto's Judgement Day", and more. For anyone interested in loose and beautiful drawing, it's obviously going to be a swell treat. Also, there are some rare self-caricatures of Fred(up til having the chance to look over James' collection(or a portion of it, I'd seen only one or two that he'd drawn of himself, including the half-finished one that's on view in "The Illusion of Life"). So enjoy your holiday, and see you on Tuesday. Thanks Jenny. This is wonderful, wonderful stuff. As mentioned on another blog, you are doing more (along with a few other animation historians and artists) for animation history that had been done overall in years. Hurray to you (and to the others that are leading this trend)! And don't forget to post the rest of the drafts for All the Cats Join In! P.S. What drinking was to the old animators I think blogging may be for this generation. Yet another addiction. Chris--not a thing on Rinaldi, excpet what's in the books. Darn it--I wish that weren't the case! Have you been to Mark Kennedy's blog? Ask him to write about Rinaldi. His link's on my page. I think youre onto something about the addictions. No kidding! Of course, it was SUCH a martini culture then; "beer" wasn't even considered real drinking--I'm talking hard liquor. If you managed to avoid alcoholism, I'm convinced you simply weren't gentically disposed for it. Fred, unfortunately, had that disease in his family--father, brothers.